When one listens to “Take That Pill” by Los Angeles EDM (electronic dance music) infused pop band Ready Never, we hear a band that is brimming with confidence and creativity. While at times on their latest release Eleuthophobia, it feels like the two styles should be kept separate since they both some completely different, by the end of the record we realize that the bridge that Ready Never have constructed to show off their creative ideas won’t be crumbling fast. Sounding very similar to Manhattan DJ duo Timeflies with their electronic influenced music, Ready Never has crafted a very catchy album for those willing to listen to what the duo has come up with. 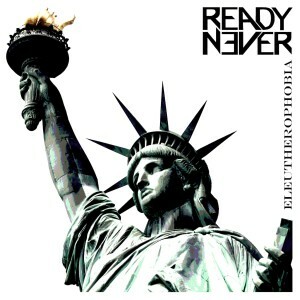 The story of Ready Never begins when Beni Ed and Rudi Meibergen began writing songs together in 2012. Since Beni was working as a touring musician in Los Angeles and Rudi was a composer in Santiago, Chile, they began exchanging ideas for songs over the internet, and soon after Ready Never was born. After both musicians’ finished touring in separate bands and winning awards for their individual contributions to music, Rudi and Beni came together officially in 2013 in Chile to begin work on Eleuthophobia. After creating a few music videos for their new songs, the response grew to the point where the band could become a more serious project. The band went onto add Clinton Karcher on drums and Sean Mahaffey stepped up as their in house remixer. The album’s first song “Take That Pill”, which is about a cultural love of pharmaceuticals, it is a happy and light track that introduces the band and their sound perfectly. The vocals are awash in auto tune, with Beni shouting the phrase “take that pill.” The synth heavy track sounds like something more along the lines of Paul Okenfold or other techno inspired DJ’s, instead of the anthem it wants to be. “Victim of Vice” is an instrumental track that shows off Beni’s stellar bass skills. The interesting thing about Ready Never is their ability to play instruments right alongside the electronic elements of their music, especially when every sound in their songs could be reproduced entirely on a computer. “My Eye Know Might” has the same sound as the previous tracks. The only difference is the vocals, which sound more jumbled and inconsistent when listened to alongside the other vocal tracks on the record. While it is evident that Beni can sing on songs such as “Take My Pills” the auto tune takes away from hearing Beni’s natural sounding voice which could add a rawer vibe to the band’s songs. While Ready Never is sure to be a hit with fans of DJ’s and dance music, the groups fusion of pop, dance, and electronic music may be lost on pop fans, since the combination falters on some of the tracks on Eleuthophobia.